As a rule, reviewers generally don’t and shouldn’t personally insert themselves into a review. However, when asked place of birth (even though an American citizen), my response is somewhat of a trivia question. To wit, name an ancient city, the gateway to Europe, the gateway to Asia (at least Asia Minor and the Middle East anyway) and has had at least three historic names. The answer, of course, is Istanbul. 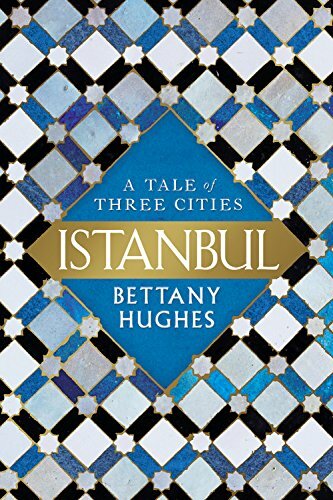 It is an ancient city that has stood at the two gateways and been known, respectively, as Byzantium (or Byzantion), Constantinople, and Istanbul, with a smattering of different spellings in various languages over thousands of years. From prehistory to modern day, it has maintained a strategic position in history and geography due to its location at the entrance to the Bosphorus, between the Black Sea and the Mediterranean. It has been fought over and fought for, over the millennia, precisely because of its position, controlling and dominating that waterway as well as access to Europe and Asia Minor and, for Russia, access to the Mediterranean. Its location has been a financial windfall for successive regimes and empires as a result of requiring the payment of transit tolls and the provision of foodstuffs and many other products in the maritime trade of the Mediterranean world. Those many regimes and empires range from its establishment as Byzantium by the ancient Greeks and multiple incarnations of the Roman Empire after Constantine the Great made it his capital in the early fourth century of the Common Era (CE) to that of the Ottoman Empire and the modern day Turkish Republic, both of Islamic dominance, following the former’s demise after World War I. Important events, dates and personages in its history include Persian King, Xerxes I, who first bridged the Hellespont in the fifth century BCE on his way to besieging Byzantium, Constantine the Great who made Christianity the official religion of the Roman Empire in the early fourth century CE, the game-changing siege and fall of the city by the Muslim army of Mehmed the Conqueror in 1453 and Kemal Ataturk, the father of the Turkish state established in the 1920s. This just a short list. There are many other emperors, kings, eunuchs, peoples, military men and even women who had their influence on the growth and development of the city. From the destruction by some of previous temples and monuments to other rulers to the construction of baths, defensive walls, palaces, monuments, churches especially (think Hagia Sophia) and harbors to facilitate trade, the city has been, to many, the center of the world. Not surprisingly, this volume is written chronologically. Each chapter covers an ostensibly significant period from prehistory to the 20th century and each includes virtually all of the important and influential personages and events therein. However, there is some tendency at times to jump around somewhat and provide relevant side information outside the designated period. Indeed, one will become acquainted with many saints, obscure figures, and occurrences about which one will probably not know anything. Be prepared to learn as this book is chock full of such data. In addition, the maps included are numerous and depict everything from the city itself, its defenses, growth, locations of important temples, building and churches to the wider Mediterranean world and the extent of respective empires. They are extremely helpful, detailed, and informative in that regard. While interspersing relevant illustrations throughout the text, there is also a section of illustrations, mid-volume, which ranges from a medieval map of the Constantinople area, icons, portraits, paintings, coins, and jewelry to those of more contemporary times following the advent of modern photography. One look at the bibliography demonstrates the research which the author performed and the 66 pages of endnotes include even more information of interest and context in addition to that in the text. This is a large tome of 800 pages, including index. Do not expect to read it in one sitting. Spend considerable time and thought ruminating on the influence that such a venue has had on world and human history in particular. For one, some day possibly when retired, a return to my birthplace would be fascinating, notwithstanding the conflict, turmoil, and unrest in that part of the world, to see and experience first-hand some of what can be found on the pages of this magnum opus.